Genesis Death Duel (USA) in 08:24.73 by Trask. Death Duel is a side-scrolling first person shooter where the player controls a mech versus a set of nine other mechs. 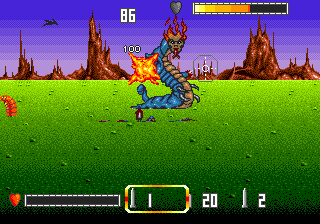 There is a bonus stage after each battle where the player must qualify for the next battle. The player has to purchase repairs, weapons and ammunition with the credits that are earned for destroying the enemy body parts and completing the rounds quickly. In this run, Trask takes out the enemies mostly through well placed missiles and the more expensive homing missiles. At one point a missile is used to punch through a wall to open up a path for more missiles.